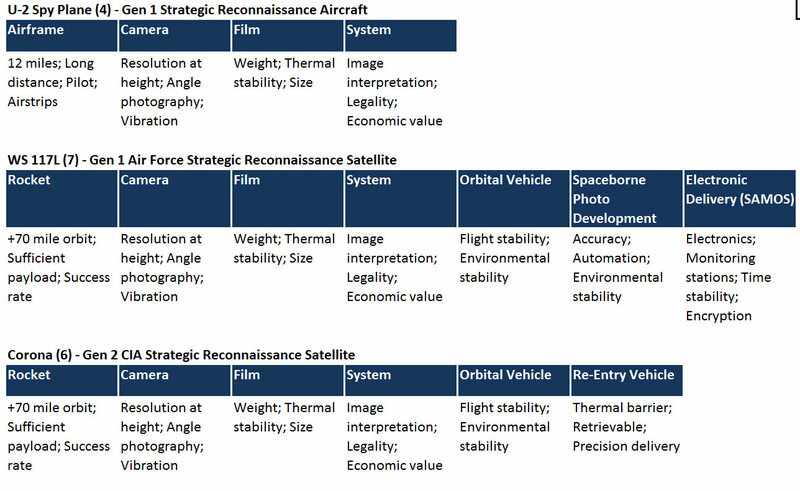 Re-entry parameters for Corona film capsules. President Eisenhower had granted the U-2 team at the CIA significant leeway in making their first flights in 1956; after over-flying Moscow and St. Petersburg in their first sorties on July 4 following Kruschev’s visit to the American Embassy the Soviets were very upset. The USSR had detected the U-2, despite initial beliefs that this would not have been possible. However, the photographic analysis system that the CIA had put in place brought significant value from the flight – Eisenhower wanted more information but without the political risk. The US was caught in a paradox; the strategic reconnaissance flights could not continue, but the information derived was extraordinarily value in the developing Cold War. When the team at the Baikonur Cosmodrome put Sputnik into orbit on Friday, October 4, 1957 and the doctrine of space overflight was established, the answer became clear. The US would commence the Corona program, directed by the CIA, which would utilize the system, cameras and films developed with the U-2, but make use of an orbital, rather than airframe, platform. Re-entry and film recovery was a crucial component in enabling Corona. Corona wasn’t the US’s first foray into satellite reconnaissance. For years the US Air Force, following guidance from the RAND Corporation had pursued the WS 117L; a theoretical satellite platform far more advanced than what the initial Coronas would deliver. The WS 117L was much more complex; (1) it developed the film in orbit, (2) that film was then beamed down via advanced electronics components and television systems, (3) over encrypted signals, to (4) a wide array of receiving stations. Corona was far more simple and benefited from an advance Eisenhower showed the world on television; a re-entry vehicle. The US had developed much more reliable methods of re-entry than the USSR. By using less aerodynamic shapes which slowed re-entry and sacrificial layers which burned off to reduce heat, the US was confident it could not only send objects into orbit, but retrieve them as well. The components which enabled the U-2, Corona and blocked the WS 117L. To get to Corona, which was the right form factor and platform, two types of sub-components had to be identified. First; the benefits of the systematic photographic analysis of the U-2 had to be realized. This system, as seen through the eyes of President Eisenhower, was an enabling precursor. It paved the way to see the value of strategic reconnaissance. Equally, if not more, important was the development of a re-entry vehicle. This system would allow film to be sent from the satellite platform and be retrieved over the Pacific Ocean. These two enabling precursors allowed Corona to come into existence. Second, impractical and blocking components in the WS 117L had to be avoided. Without a re-entry vehicle (which had not been developed at the time of the initial RAND report), photos had to be developed in orbit and then transmitted to Earth via television signals. This required a broad network of receiving stations (difficult to do and maintain secrecy) and encryption software; both of which were costly. At this time the US had the benefit of having been an innovation participant, as opposed to an innovation observer. As a participant, President Eisenhower and the CIA knew what was valuable and what was not. the casual observer could not know that the film packet, using the photographic and film systems devised for the U-2, when put in Corona, would be exceptionally valuable. Because the US had attempted, engineered and developed solutions to the known problems as an actual innovation participant, they were able to make use of their knowledge to drive value in a situation that others would not have recognized. Without rendezvous, a Soviet moon landing would have required at least two space-walks. In the US space program, it was believed that the early refinement of rendezvous; the art and science of getting two objects to contact each other while in orbit, provided strategic advantages to those programs that hadn’t explored this capability. Rendezvous was Buzz Aldrin’s field of study This is illustrated by this Space.com infographic which outlined how the Soviet moon landing method required five stages, compared to the US’s three, as well as a space walk to access the moon lander by the lone cosmonaut. This entry was posted in Aerospace, Innovation, Invention. Bookmark the permalink.